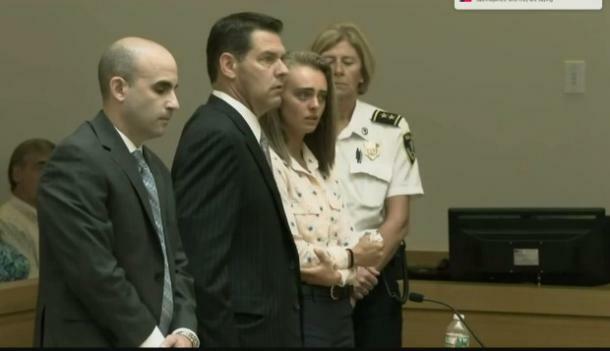 In a landmark ruling, Bristol County (Massachusetts) Juvenile Court Judge Lawrence Moniz has found 20-year-old Michelle Carter guilty of involuntary manslaughter in the death by suicide of her then-boyfriend, Conrad Roy III. Roy tragically took his life at the young age of 18 years old via carbon monoxide poisoning while sitting in his pickup truck in July of 2014. But unlike most instances of suicide, in this case, the teenage boy did not act alone. Carter, his then 17-year-old girlfriend, was right there with him in a sense. She'd been sending Roy text messages for at least three weeks prior encouraging him to kill himself, going so astonishingly far as berating him for getting cold feet, insisting that he "promise" to follow through — and then instructing him to get back into the truck after he texted her to say he'd gotten out because he was scared. "Knowing that Mr. Roy is in the truck, knowing the condition of the truck, knowing, or at least having a state of mind, that 15 minutes would pass, Miss Carter takes no action in the furtherance of the duty that she has created by telling Mr. Roy to get back in the truck. "The location where Mr. Roy’s truck was located was approximately one-half mile from the public services office … which included both the fire department and the police department. "She did not notify his mother or his sister even though just several days before that she had requested their phone numbers from Mr. Roy and had obtained them and had opened a line of communication with Camdyn Roy [Conrad's sister] … just a few days before the events in question. "And finally, she did not issue a simple, additional instruction: get out of the truck." The judge also stated clearly that he did not find the defense's argument on behalf of Carter's innocence — that she was involuntarily intoxicated by antidepressants — to be credible. To the contrary, testimony from several of Carter's classmates points to a far more insidious motivation. According to KTLA 5, additional classmates claimed that Carter would text them frequently about "struggles with an apparent eating disorder, about her loneliness and feelings of worthlessness over not having friends, and about her 'cutting' herself at times." It is the belief of these girls that Carter was hoping "to get the attention of girls who had stopped talking to her." Carter, who was tried as a minor, will be free on bail until her scheduled sentencing on August 3, 2017, at which time she faces up to 20 years in prison. This case will be closely watched and examined by the legal community, as experts believe it may well "set legal precedent for whether it’s a crime to tell someone to commit suicide [and it] may also spur lawmakers to codify such behavior as criminal." For those wondering how text messages could hold sp much power over an 18-year-old boy/man, here are just 12 of the brutal exchanges between Carter and Roy leading up to his tragic death. Roy: "If you were in my position. honestly what would you do"
Carter: "I would get help. That's just me tho. When I have a serious problem like that my first instinct is to get help because I know I can't do it on my own"
Later that day, however, Carter and Roy discuss the best way for him to produce carbon monoxide (CO). Carter: "Well there's more ways to make CO. Google ways to make it ..."
Roy: "portable generator that's it"
Roy: "Idk yet I'll let you know"
Roy: " Another day wouldn't hurt"
Carter: "...Well in my opinion, I think u should do the generator because I don't know much about the pump and with a generator u can't fail"
This is series of messages sent over a span of nine days. The "---" indicates a pause between conversations. Carter: "Do you have the generator?" Carter: "WELL WHEN ARE YOU GETTING IT"
Carter: "You better not be bull sh*ting me and saying you're gonna do this and then purposely get caught"
Roy: "I'm just to sensitive. I want my family to know there was nothing they could do. I am entrapped in my own thoughts"
Roy: "like no I would be happy if they had no guilt about it. because I have a bad feeling tht this is going to create a lot of depression between my parents/sisters ... i'm overthinking everything ... f**k. I gotta stop and just do it"
Carter: "I think your parents know you're in a really bad place. Im not saying they want you to do it, but I honestly feel like they can accept it. They know there's nothing they can do, they've tried helping, everyone's tried. But there's a point that comes where there isn't anything anyone can do to save you, not even yourself, and you've hit that point and I think your parents know you've hit that point. You said you're mom saw a suicide thing on your computer and she didn't say anything. I think she knows it's on your mind and she's prepared for it ... Everyone will be sad for a while, but they will get over it and move on. They won't be in depression I won't let that happen. They know how sad you are and they know that you're doing this to be happy, and I think they will understand and accept it. They'll always carry u in their hearts"
Roy: "i don't want anyone hurt in the process though ... when they open the door, all the carbon monoxide is gonna come out they can't see it or smell it. whoever opens the door"
Carter: "They will see the generator and know that you died of CO. . . ."
Roy: "hey can you do me a favor"
Roy: "just be there for my family :)"
Carter: "Conrad, of course I will be there for your family. I will help them as much as I can to get thru this, ill tell them about how amazing their son/brother truly was"
Roy: "Idk I'm freaking out again ... I'm overthinking"
Carter: "I thought you wanted to do this. The time is right and you're ready, you just need to do it! You can't keep living this way. You just need to do it like you did last time and not think about it and just do it babe. You can't keep doing this every day"
Roy: "I do want to. but like I'm freaking for my family. I guess ... idkkk"
Carter: "Conrad. I told you I'll take care of them. Everyone will take care of them to make sure they won't be alone and people will help them get thru it. We talked about this, they will be okay and accept it. People who commit suicide don't think this much and they just do it"
Carter: "So I guess you aren't gonna do it then, all that for nothing ... I'm just confused like you were so ready and determined"
Roy: "I am gonna eventually ... I really don't know what I'm waiting for. . but I have everything lined up"
Carter: "No, you're not, Conrad. Last night was it. You keep pushing it off and you say you'll do it but u never do. Its always gonna be that way if u don't take action ... You're just making it harder on yourself by pushing it off, you just have to do it ... Do u wanna do it now?" Roy: "Is it too late? ... Idkk it's already light outside ... I'm gonna go back to sleep, love you I'll text you tomorrow"
Carter: "No? Its probably the best time now because everyone's sleeping. Just go somewhere in your truck. And no one's really out right now because it's an awkward time ... If u don't do it now you're never gonna do it ... And u can say you'll do it tomorrow but you probably won't ... You just need to do it Conrad or I'm gonna get you help ... You can't keep doing this everyday"
Roy: "Okay I'm gonna do it today"
Roy: "I promise babe ... I have to now"
Roy: "where do I go? :("
Carter: "And u can't break a promise. And just go in a quiet parking lot or something." Carter: "Go somewhere you know you wont get caught. You can find a place I know u can ... Are u doing it now?" Roy: "still have no clue"
Carter: "Not finding a place to go isn't an excuse ..."
Roy: "I know where to go"
Roy: "a park and ride"
Carter: "Ohhhh okay gotcha. Are you going now?" Roy: "either that or go to the beach"
Carter: "Why would u go to the beach?" Roy: "well that's where My moms going"
Carter: "I thought u were just gonna do it"
Roy: "my moms making me go ... When I get home I'm gonna do it"
Carter: "Okay promise? I'm going kayaking anyways"
Roy: "Haha you love kayaking"
Carter: "Yup :) s0something I wish we coulda done :("
Roy: "Make sure you take your son kayaking :)"
Carter: "Haha of course I will :)"
Roy: "I love you. so much"
Carter: "I love you forever"
Roy: "I'm in the worst pain right now. like it's unbearable"
Carter: "I think it's time to do it now then ... Do you agree ... Please answer me"
Roy: "I'm still at the beach"
Carter: "I'm happy to hear that ... When you get back from the beach, you gotta d do it. You're ready, you're determined. Its the best time"
Carter: "Yes, no more thinking you need to just do it. No more waiting"
Carter: "You're fine, it's gonna be okay. You just gotta do it babe, you can't think about it"
Roy: "okay. okay I got this"
Carter: "Yes you do, I believe in you. Did you delete the messages?" Roy: "Yes but ur gonna keep messaging me?" Carter: "I will until you turn on the generator"
Roy: "Okay well I'm bringing my sisters for ice cream." Carter:"So will you do it when u get back?" Roy: "yup I'll go right there"
Carter: "Are you gonna do it now?" Roy: "i just don't know how to leave them ya know"
Carter: "Say you're going to the store or something"
Roy: "Like I want them to know I love them"
Carter: "They know, that's one thing they definitely know ... You're overthinking"
Carter: "Are you gonna do it now"
Roy: "I haven't left yet haha"
Carter: "Okay. You can do this"
Roy: "okay I'm almost there"
Carter: "Please answer me ... I'm scared are you okay? I love you please answer ... You're at your dad's ... Camdyn told me. I'll get you help soon I guess ... I thought you actually did it"